Alejandro Consolacion II: Bio & Choral Music | Santa Barbara Music Publishing, Inc.
Alejando D. Consolacion II enjoys a dual career as organist and composer. He finished his Graduate Degree of Organ Performance at Westminster Choir College and received his Performance Diploma in Organ Performance from the Associated Board of Royal Schools of Music in London and Licentiate in Organ Performance at the Royal Schools of Music with His prolific compositions vary from small to large-scale choral works, music for solo instrument, chamber music and orchestra. His works was premiered or performed by the Westminster Choir College (USA), Taipei Male Choir (Taiwan), University of Philippine Madrigal Singers (Philippines), Pilgrims Mission Choir (Korea) and the Little Singers of the Yokosuka Arts Theater (Japan). As an organist, he was invited to perform for Her Royal Highness Queen Sofia of Spain during her visit to Manila in 2001 playing the newly restored historical instrument at the San Agustin Parish in Intramuros. He was awarded 2nd prize in the National Organ Improvisation Competition held at the University of Michigan last October 2014 and was awarded the audience prize. AJ regularly appears in organ recitals and festivals in USA, Hongkong and Manila. He was a member of the Artistic Committee for the International Bamboo Organ and was a resident composer (2007 – 2012). 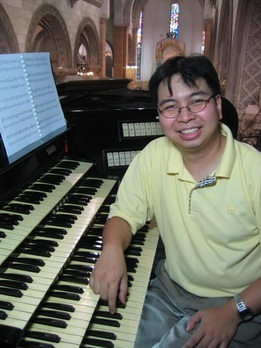 He has recorded numerous CD’s playing the Historical organs in the Philippines. His recordings were released under the Diego Cera Records and CPO Label. AJ, born in Manila on 04 October 1980, is widely known and respected for his gift of improvisation attributed to his lush harmonies, chant-like melodies and witty syncopated rhythms, which give his works a unique spiritual language. Alejandro Consolacion II has 3 titles published with Santa Barbara.